Call me crazy, but I don't see us climbing out of this recession any time soon. I think we have another two years of hard times ahead, maybe more. I'm trying to be prudent with the household finances, so I want to spend less money on wine. But I want to continue to drink fantastic wine. Sounds like I want my cake and to eat it too, but no - I think there are a lot of excellent wines in NYC retail shops that sell for $20 and under. Used to be $15 and under, but those are far fewer now than they were 5 years ago. But here's the thing - when I say excellent wine, I really mean it. I mean wines that are compelling, that offer complexity and interest. Wines that I would confidently open for fellow wine lovers over for dinner. Excellent wines, wines that I feel great about buying now because they represent some of the best juice on the market at this price point. Here is my "Best $20 and Under" case of wine, each wine available in NYC right now (hopefully elsewhere too). Not all of these can be found at the same store, I'm sorry to say, but I'm going for quality here, not convenience. These are all almost French wines because that's what I know, but there must be similarly excellent wines from Italy, Germany, Austria, and elsewhere. Please feel free to chime in with your suggestions. Domaine de Montbourgeau Crémant du Jura, $20, Rosenthal Imports. Delicious and earthy Blanc de Blancs. Give it some air and watch it expand. 2007 Domaine de la Pépière Muscadet de Sèvre-et-Maine Sur Lie Clos des Briords, $16, Louis/Dressner Selections. Sharp and vibrant old vines Muscadet from one of the top producers, and this vintage seems like it will be one of the better ones in recent years. I've heard several people who know an awful lot about wine say that this is the finest value in the entire world of wine. 2007 Gilbert Picq Chablis, $20, Polaner Imports. 2007 is a return to Chablis in Chablis - the wines will speak of the sea shells and iodine, brine and minerals. This wine has ripe fruit too, and is quite the elegant little package. I will say this, though: for an extra $4 you can buy the 2007 Picq Chablis Vieille Vignes, which is a tremendous step up, and I bet will improve for a decade minimum, should you be the patient type. NV Audrey & Christian Binner Saveurs Printanières, $17, Jenny & François Selections. This is a bone dry blend of white Alsace grapes, and it is ripe, herbal, and completely delicious. For about $22 you can buy the 2004 Binner Reisling Katzenthal, which is a big step up for your 5 bucks. That wine is drinking beautifully right now too. 2007 Domaine de la Sauveuse Cuvée Carolle, $18, Imported by Vintage Trading, Inc. A beautiful wine from the Côte de Provence, a blend of 85% Rolle (that's Vermentino to you Italo-philes) and 15% Ugni-Blanc (that's Trebbiano to you Italo-philes). Made in an oxidative style, this wine is full of orange fruit, and feels fresh and minty. Great acidity balances the rich flavors. If this wine were from someplace famous like Burgundy it would cost $50. 2007 François Pinon Vouvray Tradition, $20, Louis/Dressner Selections. This is a blend from several parcels on mostly clay soils and the wine is round and rich, with a bit of residual sugar. I prefer the 2007 to any recent vintage, as it has great acidity and balance, and the flavors are absolutely fresh and clean. I'm going to wait a few months before opening mine, although you could wait 8 years if you like. You could also spend $24 and get Pinon's 2007 Vouvray Silex Noir, a drier and more elegant wine. One is not better than the other - different styles. 2007 Michel Tête Juliénas, $20, Louis/Dressner Selections. It's been a while since I've liked this wine as much as some of the others in the impressive Dressner Beaujolais stable, but the 2007 is a truly lovely wine. Fresh, ripe, snappy, just a great Beaujolais. 2006 Weinhof Scheu Spätburgunder, $18, Savio Soares Selections. In my book, this is the truest and best Pinot Noir on the market right now for $20 or less. Fresh and pure, and on the lighter side of the Pinot spectrum, this wine will surprise you with its grace and hold your interest with its deliciousness. 2007 Bernard Baudry Chinon Les Granges, $18, Louis/Dressner Selections. 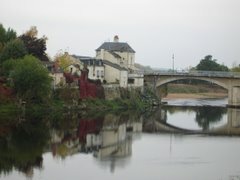 Baudry is the reference point for Chinon. This is the "entry level" wine, which is a joke because it is a complete wine, ripe, complex, cellar-worthy. Versatile too - this works just as well with hearty vegetable soup as it does with roast beef. I don't even want to discuss the other Baudry 2007's here, because I don't want to get you all worked up. 2005 Domaine Rimbert Mas au Schiste, $20, Jenny & François Selections. A blend of old vines Carignan (is there a more under-rated grape? ), Syrah, and Grenache. This wine floats like a butterfly and stings like a bee. I love this wine, plain and simple. Great definition and clarity for a full bodied wine from the Roussillan, with a lovely perfume of ripe fruit and lots of interesting mineral and soil tones. This wine ages well too. For $14 you can get the 2007 Domaine Rimbert Travers de Marceau, a less intense and complex, but also very delicious wine that omits the Grenache and includes Cinsault and a little bit of Mourvedre. 2006 Mas des Chimeres Coteaux du Languedoc, $20, Louis/Dressner Selections. 75% Syrah, some Grenache, Cinsault, and Mourvedre make up the balance. Classic peppery and meaty Syrah, with good energy and balance. A wine for Boudin Noir, ribeye steak, grilled portobello mushrooms, and things like that. You may have noticed that there are only 11 wines in this case. It's recession - 11 is the new 12. 2005 Dirler Pinot Cépage Pinot Noir, $33, Robert Chadderdon Selections. There are a few unusual things about this wine. First of all, although it is made of Pinot Noir, it is white wine. Or is it - I'm just not sure. It looks like a white in the bottle but when poured looks more like a rosé. The label doesn't say. So I think we're talking about a rosé of Pinot Noir. Looking around the interweb, there is no information that I can find about this wine. Actually, I can't find much of anything about Domaine Dirler-Cade at all. And this estate is surely one of the finest in the Alsace. All I found is Jaime Goode's little tidbit, and Steven Tanzer's reviews of Dirler's 2005 lineup, in which this wine is not mentioned. And some other yo-yo wrote this bit about Dirler's Crémant. All I know is this: Dirler farms organically, and as of the 2007 vintage, using biodynamic methods. Whereas many Alsace producers make wines with some residual sugar, Dirler's are better known for their searing dryness, their mineral intensity. I don't know a lot about Alsace wines, but so far this is my favorite producer. And it is a truly beautiful wine, memorable and I believe, unique. It is 14.5% alcohol! And still perfectly balanced, given sufficient air time. It is the color of ripe peach skin. At first it smells of resin and alcohol, with cinnamon scented orange fruit underneath. It reminded me of one of those northern-Italian skin contact wines. But that was only temporary. With a half hour open this wine really blossomed. The resin blew off and left behind an incredibly fresh and airy nose that offers plenty of ripe fruit, cinnamon, and a minty menthol floor. And there is a vibrant mineral character too, like the inside of a wet limestone cave. And this is all just the nose, people! It is intense on the palate, very energetic, and offers a compelling harmony of rugged minerals, ripe orchard fruit, and super-firm structure. Between this structure and the vivid acidity, I imagine that this wine will improve for quite some time in the cellar, and I plan to test this hypothesis. BrooklynLady said that she thought this would be great with a blue cheese. I respectfully disagree, as I think that the most beautiful thing about this wine, the harmonious interplay of its individually rather loud parts, would be lost in the pungency of blue cheese. Next time we open a bottle I want to have some Alsace ham on hand, or speck, or something like that. Sliced thin and served with nothing other than good bread and unsalted butter, that is my dream pairing for this wine. The savory and mellow richness of the ham would work perfectly with the harmonious intensity of this wine - in my mind anyway. I'll try this in a year or so when I open another bottle and we'll see what happens. It seems as though this wine might not be the easiest thing to find, but if you're in the NYC area, Astor Wines carries it, although it isn't listed on their website. I was down to my last two Burgundy glasses and we were having my friend Deetrane and his family over for dinner to celebrate his birthday. One of the wines I wanted to pour was the 2001 Philippe Pacalet Pommard (a bit over the hill, as it turned out, but that's another story). So on a rainy Saturday afternoon a took my 2 year old daughter into The City, as we Brooklynites call it. We went to a popular kitchen/dining/that-kind-of-thing store and I picked out four Schott-Zwiesel Burgundy glasses. I'm not buying Riedel anymore as daily drinking glasses because no matter how careful I am, I break one glass every month or so, minimum. Riedel glasses are $20 each, Schott-Zwiesel glasses are also quite nice, and are half the price. Settled. I had my daughter in one arm, the box of glasses in my other hand, and I put them on the checkout counter. The young woman behind the counter said "Oh, these are great glasses! Did you know that there is titanium in them?" No, I didn't know that. Titanium is something of a wonder-metal. It is light, not all that dense, but very strong, easy to blend with other metals to create useful alloys for things ranging from aircraft engines to plastics to the outer coating of household tools. And apparently now, wine glasses. It makes perfect sense - titanium's lightness and strength, it's white color, and the relative ease with which it can be alloyed make it a great choice for stemware. I reacted with surprise, so did my daughter, and the saleswoman said "Let me show you." She opened the box and took out one of the glasses. With a sudden movement she raised it up in her hand and banged it down on the counter, really banged it, smacking the bowl of the wine glass onto the wood. There was a loud "Gong" and I of course recoiled, trying to shield my daughter from what would certainly be a cascade of glass shards. But the glass did not break. Clearly this is the glass for me. I laughed nervously and said "Wow, that's great, I'll just move my two year old out of the way next time," and she laughed, and again, more quickly this time, banged the glass on the counter. But this time it did break. It broke kind of like a windshield, a spider web of cracks and a few large chunks flew about the counter. Scary - what if glass had hit my daughter's face? But impressive too - even though she smashed it like you would use a hammer to strike a nail, the glass did not shatter. Everyone was fine of course (except the saleswoman, who I'm guessing is not entirely fine in the head), and I still bought the glasses. And I haven't broken any yet. Then again, I haven't repeated the saleswoman's experiment. I find it hard to understand wine at large tastings because I can't enjoy them slowly and see how they unfold in my glass, see how they work with dinner. All I can really do at large tastings is just that - taste wine, and see whether or not it interests me enough to seek out on my own. It's especially hard to taste delicate and subtle wines at large events. The whole environment, to me, is just wrong for these kinds of wines. They can get lost among the larger row of wines that I might be tasting in rapid succession, or among the general sway of people and the constant noise. Almost two weeks ago at the Michael Skurnik Grand Portfolio Tasting I tasted through Pierre Yves Colin-Morey's lineup of beautiful white Burgundies and it was really an amazing experience. Not only because they seem to be such great and delicious wines, but because even in the midst of all the noise and the bustle, and having already tasted a load of wine, they were stunning for their intricate detail, their grace, their balance. Tasting through the lineup was a lesson in Burgundy terroir, and I've not before experienced that in an industry tasting environment. I haven't found a lot of information on the producer, but I can tell you this: he made wine for his father at Domaine Marc Colin until 2004, and began his négoce project in 2001. He continues to make wine from purchased grapes and now also from the parcels he inherited in St. Aubin. I don't know if the vineyards are cultivated using organic or biodynamic techniques, in fact I know nothing about how the fruit is grown or handled. I read that Colin-Morey uses 350 liter oak casks for elevage instead of the typical 228 liter barrels, that he leaves wine on the lees for a long time with no stirring, and doesn't filter the wine. I know what you're thinking - I stood before this man and tasted all of his wines and I don't know any more than this, how could that be? But at this kind of an event I can focus either on tasting wine or on asking questions about technique. I'm limited in that way, sorry. You can read a bit more about Pierre Yves Colin-Morey in this Jancis Robinson essay or on the Skurnik site. I can, though, tell you a little about why I was so impressed with the wines. They showed great clarity and detail, they were delicate and refined in texture, they were all very focused, they simmered with intensity. Also, they tasted great. If there are white Burgundies that are fish fillets poached with herbs in concentrated fish stock, sprinkled with fleur de sel and smoked paprika, Pierre Yves Colin-Morey's wines are fish caught in a cold river and immediately pan fried - that's it. There were four 2007's, and they showed the clarity and precision that I've come to expect from this vintage. They were lively and compelling wines, even the humble Bourgogne Blanc, an absolutely lovely wine with a gentle but focused core of fruit and excellent acidity. This should retail for about $25 and I am guessing it will be one of the best value whites of the vintage. The three St. Aubins were very good, although they are step up in price, as might be expected. The 1er Cru Les Champlots was very open and drinkable with a pretty nose of fresh fruit and flowers. La Chatenière was more elegant and detailed and En Remilly was richer and more intense, as one might expect from this not-so-secretly great vineyard that borders Le Montrachet. There were five 2006's and these were great wines too, although these are more difficult to drink as they are priced in the same outer limits as most wine from Chassagne, Puligny, and Meursault. Still, if I were to spend $90 on a bottle of white wine right now, it might very well be the superb 2006 Puligny-Montrachet 1er Cru Champs Gains, which was just beautiful with its expansive and complex fruit and mineral flavors, its firm structure allowing only glimpses of the elegant beauty within. So I guess what I'm saying is that I was pretty floored by these wines, and I'm curious to buy one and drink it at home. Anyone out there done that and care to share their thoughts? 2007 Latitude 50 Spätburgunder Sekt Brut Rosé, $17, Savio Soares Selections. For some reason, this is the third Latitude 50 wine I've drank in just over a week. I had the Dornfelder at the Obscure Wine Dinner, the Riesling with Szechuan food the other night, and now this. Latitude 50 refers to the northern locale of these vineyards in the Rheingau, Germany. It's not easy for grapes to ripen that far north. The fruit in this wine feels somewhat ripe, but perhaps not as ripe as would be necessary to avoid high dosage, and I suspect that the dosage is high in this wine. It tastes sweet, as opposed to ripe. I'm guessing that this is not a macerated rosé, that still red wine is instead added to the blend. The nose is creamy and a bit yeasty, with nice soil character and shy dark fruit. Later on there is something like red zinger tea or rose hips. The palate is straightforward with tasty fruit and more of that creamy character. There is enough acidity to make this wine fresh and it's very drinkable, a good sparkling rosé of higher quality than any other I can think of at this price. I could quibble about things like complexity and intensity, find little faults here and there, but what would be the point? This wine costs $17, and for serious sparkling wine, that's cheap. This is a genuinely nice wine, and a good value at this price. On another note...I'm convinced that although there are many great still wines available for less than $20, there are far fewer great sparkling wines available for less than $20. Instead of continuing to buy them and write luke-warm reviews for Friday Night Bubbles, I'm going to move to another format, something like a wine of the week. I'd rather drink great wine for $17 than pretty good sparkling wine for $17. It's been over a year on the Friday Night Bubbles thing. Change is a good thing. There will still be Champs, but there will be other wines too. We'll see how it goes. I was lucky enough to be invited to a dinner at Wine & Spirits Senior Editor Tara Q. Thomas' house recently. Julia Harding, Jancis Robinson's Assistant Editor was in town, and she has a special interest in obscure grapes. That would be the theme. What do you bring to a dinner like this? These are folks who are familiar with things that are obscure to me. My Mondeuse would be mundane, my Poulsard too popular, and my Clairette commonplace. I left this until the last minute, and then went to Slope Cellars, one of my absolute favorite Brooklyn wine stores. Patty, one of the owners, suggested a red wine from Germany made of a grape called Dornfelder. I liked this immediately because I’m pretty sure it is also the name of one of the main characters from the hit 1980’s film Revenge of the Nerds. And also because Savio Soares imports it, and I trust him as an importer. I also chose a sparkling Scheurebe, another German wine, and another Soares selection. When I walked in I was greeted warmly by Tara’s husband Robert who helped me unpack my wines and said “Oh nice, a Scheurebe. We just did a Scheurebe dinner, all Scheurebe, all the time.” He then went back to deep-frying chickpeas. Okay, so Scheurebe isn’t obscure in this house. But aha – I brought a sparkling Scheurebe, the NV Brüder Dr. Becker Scheurebe Sekt Extra Trocken, and Julia had never had a sparkling Scheurebe. This must, by the way, set the world record for the most times the word Scheurebe is used on a single blog post. Who were the other guests at the dinner? Oh, just Ray Isle, Joshua Greene, and Jamal Rayyis, a prominent wine writer. They all have done a fair amount of wine tasting, you could say. In fact, everyone at this dinner has forgotten more than I know about wine. But they were completely easy going and were there to enjoy themselves, and enjoy ourselves we did. Here are the wines we drank that evening. If these are not sufficiently obscure for you, well you can host your own obscure wine dinner. We began with the sparkling Scheurebe (off-dry, floral, interesting Wrigley’s Spearmint finish) and the 2007 Terre del Principe Fontanavigna Pallagrello Bianco, a weird white from Piedmonte. With deep-fried squid perfectly seasoned with sea salt and oregano we had the 2007 Botani Moscatel Sec from Malaga, Spain. This was my favorite of the evening’s obscure wines. It was fresh and clean with a primary white grape essence, and also a lovely green herbal finish. It paired perfectly with the squid. It is obscure in that it is a dry example of Moscatel. With seared scallops and a puree of parsley and celery roots we had the 2007 Vatistas Kidonitsa, from Greece. I had never before had a wine made of Kidonitsa, but I was assured that it was, in fact, classic Kidonitsa in character. We also drank the 2005 Cellars Unio Roureda Llicorella Blanc, a white wine from Priorat made entirely of Pedro Ximenez, of Sherry fame. Apparently the white Grenache varieties are the common white grapes in Priorat. Had I tasted this blind I would have had to guess it was an oxidized Savagnin from the Jura, and I liked it. We then drank the 1988 Chapoutier Chante-Alouette Hermitage Blanc, a fantastic wine that was rich and broad and still taut with energetic acidity. This was a beautiful wine that defies my compulsion to name specific aromas and flavors in a tasting note because it was just so harmonious and gorgeous. Marsanne, obscure? No, but this is a rare wine, and I certainly was thrilled to be able to drink it. Just gorgeous wine, memorable and inspiring. There were merely two red wines. We drank them with a perfect brisket (although I refused to finish my Hermitage and nursed it throughout the brisket, and they paired perfectly). I brought the 2006 Latitude 50 Nektar, the Dornfelder. It reminded me of Pineau D’Aunis – peppery and leafy. But it didn’t have the acidity that good Pineau D’Aunis has and overall it was a bit clumsy. Maybe it just wasn’t a good example of a Dornfelder. The other red was the 2006 Ravenswood Old Hill Zinfandel. I have almost no experience whatsoever with Zinfandel, primarily because I've never met one that I like. This one was perhaps a bit more cut than most, the flavors more precise, but I still just don't get Zinfandel. With apple crisp we had the 1994 Julius Wasem & Sohne Huxelrebe Trockenbeerenauslese, a German sweet wine made of Huxelrebe. And it was really good – great acidity, clean fruit flavors, unctuous without feeling heavy. We also had the 2007 Persimmon Creek Ice Wine, a sweet wine from Georgia (the state, not the former Soviet Republic). I think the grape is called Albarola. I can tell you that a guy named Dr. Sonny Hardman made the wine, and that he must be a man of vision. I mean honestly, who lives down in Georgia and decides not only to make wine, but ice wine? First of all, please allow me to tell you that I am a big fan in general. I love your products and enjoy sharing them with my family and friends. But today I'm writing to ask you that you as a rule, include basic information on your wine labels. Information that will aid consumers like me in making purchasing decisions. Please remember that your wines typically cost upwards of $40 here in the United States, and for most of us, that is a significant sum. Not to say that your wines aren't worth the money, because they usually are. But when I pay that kind of money for a bottle of wine, there are certain basic things that I like to know. One of the most important pieces of information that is quite often not included on your bottles is the vintage in which the majority of the grapes were harvested. I understand that you typically blend with reserve wines, but I don't think that is a good excuse for omitting this important piece of information. Your basic non-vintage wines are different from year to year (I'm writing to you, grower/producers, not to LVMH), so indicate on the bottle somewhere the vintage the wine is based on. That way I can make an informed decision, which I think I'm entitled to when I'm paying Champagne prices. If I prefer, for example, your NV Brut that is based on 2004, blended with reserve wines from 2003 and 2002, but your NV Brut that is based on 2005 with reserves from 2004 and 2003 is also on the market (quite common here in New York), I want get the wine that I prefer when I put down my $47. And I can't be sure which wine I'm buying unless you tell me by indicating this somewhere on the bottle. Furthermore, many of you release several versions of the same NV wine, differing only in disgorgement date. This is another great opportunity lost. You usually do not tell us on your labels when the wine was disgorged, so I cannot be sure that I am buying the particular wine that I may prefer. Some people say that this dearth of information is the fault of the importers and their distributing partners. But if you think about it, importers and distributors have every incentive NOT to include this information. If they could get away with keeping vintage dates off Bordeaux or Burgundy, they'd do that too. The consumer wouldn't know whether or not he or she is buying the 2004 or the 2005, and there would be no way to differentiate between wine that sells quickly and wine that sits around for a while. What distributor wouldn't want that as part of their business model? Consumers would have to be content buying a bottle simply called Domaine Leflaive Puligny-Montrachet, for example. That's it. 2004, 2005, who knows? Is the price reflective of the relative quality of the vintage? Again, who knows? Since importers and distributors have the incentive not to provide consumers with this information, I think it is incumbent upon you as a group to ensure that the base year and the disgorgement date are included on every bottle of your NV wines. You are artisans whose products can be appreciated at the most finely detailed of levels. Why deprive consumers of the ability to fully appreciate your work? The practice of omitting this information actually denigrates your wines, advancing the notion that they are the same year after year, and there is nothing to think about when buying them. This is clearly untrue, so why allow this to continue? Some of you already include base year and disgorgement date on your labels, either clearly stated or in coded form. I'm hoping that the rest of you will join in this practice as soon as possible. And by the way, I think you should also indicate the grape blend, the percentage of reserve wines in the blend, and the level of dosage, but I'll take that up with you in a subsequent letter. Thank you for taking the time to read this, and thank you again for your wonderful wines. NV Domaine Parigot & Richard Crémant de Bourgogne Blanc de Blancs, $20, Becky Wasserman Selections. This is a blend of mostly Chardonnay and some Aligoté made in Savigny-lès-Beaune by a producer that makes only Crémant, highly unusual for a Burgundy producer. Parigot & Richard make a range of sparkling wines, including L'Or de Parigot, a rosé with edible gold flakes floating in it. Is that tacky? Can we take this producer's other wines seriously knowing that they put gold flakes in one of their wines? I wish I had a definitive answer for you, but I do not. I feel confused by this Blanc de Blancs, and confused about the producer in general. I knew nothing of the producer when I purchased the bottle. I bought it based solely on the fact that Becky Wasserman selected it. We drank the wine as an aperitif and then with a simple dish of pan-fried pork chops with mustard greens, carrots, and brussels sprouts. It was fine, certainly not bad, but nothing special. The aromas are bit yeasty and there is no soil or mineral character on the nose at all - just yeasty fruit. It is ripe enough, but not at all complex,and there is not enough acidity to make the wine feel energetic. But it tastes fine, not too sweet, inoffensive. And with about a half hour open, I realized that it actually tastes like still Chardonnay from Savigny-lès-Beaune, which is a good thing - it tastes good. Except the bubbles add nothing to the experience. I think this wine would be better as a still wine. The harmonious marriage of the two white grape varieties in Burgundy, Chardonnay and Aligoté, give this crémant its uniqueness and nobility. The Chardonnay, by far the majority, supplies it with all the traits of its character. The Aligoté gives it the gift of vivacity. Its robe, wheat-like in color, evokes freshness and delicateness. Its bewitching aromas are completed by enjoyable fruity notes. Well balanced, this cremant's vitality and youthfulness will know how to seduce the palate of amateur connoisseurs of cremant Blanc de Blancs. Read that three times and see if you can help falling asleep. Anyway, this is perfectly decent wine from a producer that may or may not be the Perrier-Jouët of Burgundy. Sorry if I sound bitter, but I feel duped. Becky Wasserman selected this?!? With all due respect, and I have nothing but respect for Becky Wasserman, what am I missing here? Excellent Pinot Noir...Under $20 ??? I was happy to read Aric Asimov's article about what he calls a "rebellion" in California Pinot Noir. I have always believed that the preponderance of syrupy fruit bombs among made-in-the-USA wines is more about decision making than about terroir. I've had graceful and complex Oregon Pinot Noir, energetic and resonant Long Island Cabernet Sauvignon, and balanced and delicious California Chardonnay. But those are the exceptions - the rule seems to be jammy sleep-inducing wines with little balance. This rebellion notwithstanding, the problem for consumers continues to be one of price. The American wines that I'm referring to are all expensive, sometimes very expensive. Is it truly impossible to make excellent wines in the balanced and energetic style, that retail for under $20? I looked at Asimov's list of producers he recommends at the conclusion of his article, and only one of them offers a wine that retails for under $30 - Au Bon Climat. What's up with that? Burgundy isn't cheap either, but most producers make a Bourgogne or even a village wine that retails in the $20 range - and these can be fantastic wines. So here is a challenge for American producers of Pinot Noir: make a wine as good as this one, a beauty from the Pfalz in Germany, the 2006 Weinhof Scheu Spätburgunder, $17, Savio Soares selections. This wine is airy and fresh and it offers what to me is the essence of Pinot- ripe and juicy fruit, but elegant and energetic. It has great balance and acidity and although it isn't a complex wine, it is an absolute pleasure to drink. Low in alcohol at 12%, it compliments many types of food. I can honestly say that this is the finest under $20 bottle of Pinot that I've ever had. And Savio Soares brings in natural wines, so although I don't know the exact details, I'm sure that there is no weedkiller spraying, acidification, chaptalization, spoofulation or other 'izations' or 'isms' going on here. How does Weinhof Scheu make this great of a Pinot, ship it to America, and sell it for under $20? I don't know. But surely our cool climate Pinot producers can match this feat. Can't they? My buddy Adam loves anchovies. He eats them absentmindedly while reading, the way some of us might eat crackers. They appear regularly in his excellent cooking, although you wouldn't know this unless you ask him how he achieves that deep flavor, that savory something at the core of the dish. And because he takes food and drink quite seriously, Adam has tasted many anchovies, trying to determine the best brand in the NYC market. He thought he had this all figured out until just a few weeks ago - he likes the 230 gram jar by Filetti di Alici, anchovy fillets that are brined and then packed in olive oil and that retail for about $13. 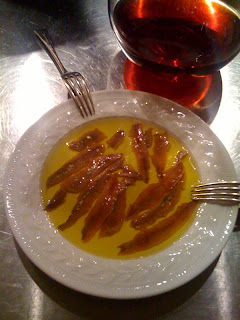 But then while poking around an Italian food importer's store in Carroll Gardens he saw a large can of anchovies packed in salt, the same brand too, Filetti di Alici. The proprietor warned him that these fish would require cleaning and filleting by hand, but Adam is never deterred by such things. He bought the whole can - 1 kilogram for $20. The other night I was at his house and Adam was telling me about how delicious the salt-packed anchovies are, how much better they are than the oil-packed fish. But also how huge of a pain they are to clean and fillet. "How much better could they really be," I asked. "Is it worth it?" He looked at me as if to say "What's wrong with you!" and said "Of course it's worth it. Like good wine and great wine." 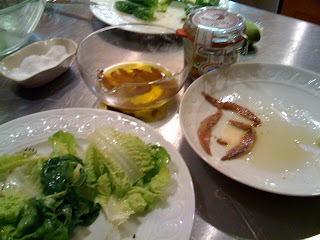 Adam then proposed that we taste the two types of anchovies side by side so I could see for myself. He prepared a simple salad as a foil, and allowed the fish to come to room temperature - he had already prepped quite a few of the salt-packed kind and stored them in oil in the fridge. 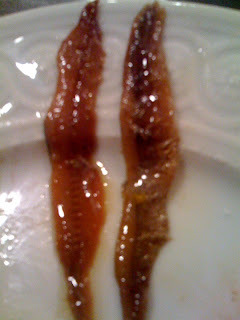 You can sort of see from the photo on the right (all pix taken on Adam's I-phone - we did our best) that the salt-packed anchovy on the left is more rosy in color than the oil-packed fish on the right. And there was, in fact, a big difference in flavor. The salt-packed anchovies felt completely unadorned, they were the purest essence of anchovy, each fish a delicate brush of umami against the tongue and the roof of the mouth. The oil-packed anchovies were delicious too, but were saltier and felt cluttered compared with the spartan grace of the salt-packed fish. Okay, I was convinced. "But wait - how much work is it to prepare these," I asked. So of course Adam gives me 5 or 6 salt-packed fish so I can see for myself. It was definitely painstaking work, fit only for those who enjoy detailed labor, like roasting and grinding spices, assembling a photo album, or building a deck for a house. But it was satisfying work too, and I got into a good rhythm after the first fish. When I was finished (10 minutes?) we took the lovely fillets and set them in a pool of olive oil. And what to drink with such a feast? Adam decanted a bottle of 2004 Jacques Puffeney Arbois Poulsard, Rosenthal Selections, $24, a strange and utterly delicious combination. The bright red fruit in this wine is clear as a bell, the texture is so light, the wine is crystalline in its purity. Yet there is solid tannic structure that provides the firmness to stand up to the umami of the fish. The fruit and the acidity are gentle enough to compliment, not overpower the delicacy of the anchovies. A Poulsard with anchovies...who knew? 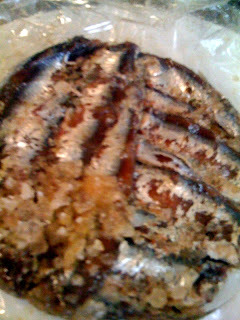 As excellent as this was, I currently have no plans on enjoying salt-packed anchovies anywhere other than Adam's house. NV Benoît Lahaye Brut, $40, Jeffrey Alpert Selections. Last summer I was in Portland with my wife on a quick vacation and we had dinner with Peter Liem and some of his friends. 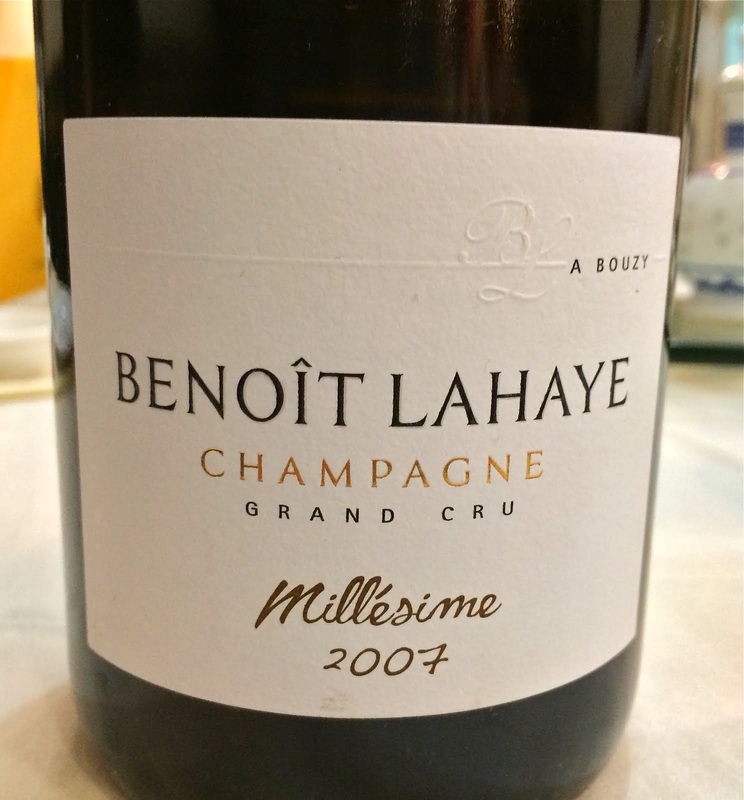 He brought a few truly special bottles of wine from France for this dinner, one of which was the 2002 Benoît Lahaye Brut Champagne Millésime. This wine was so delicious that I made a promise to myself to buy Lahaye's wines whenever I could find them. Turns out that finding them is no small feat. I do not mean to say this rudely, but have you ever heard of Jeffrey Alpert Selections? I haven't. There is no website for the importer that I could find - an interweb search turned up more Herb Alpert (the genius musician behind, among other things, the cantina scene music from Star Wars, at the bar in Mos Eisley) than Jeffrey Alpert. But I finally found a NYC store that sells the NV Brut and I pounced. The vintage wine, the Brut Nature, and the other cuvées - nope, not to be found around here, which is such a shame. 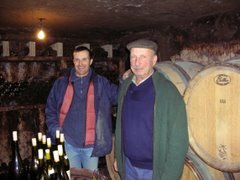 The best description of Benoît Lahaye is again on Peter Liem's website, but I will summarize: Benoît Lahaye's vineyards are farmed organically and his wines are made naturally with minimal intervention. The estate is small at under 5 hectares, and yet Lahaye vinifies individual parcels seperately in order to produce the best possible blends. This wine is 85% Pinot Noir and the rest Chardonnay, using 30% reserve wines. It is such a beautiful wine, really stunning. The nose is airy and pure, very gentle, and reveals layers of ripe fruit, roast nuts, and minerals. It is vinous and intense, round and rich, ever so slightly smokey. This is one to get lost in, and I refused to drink the last bit so I could keep smelling it. The fruit is generous and ripe on the palate - anyone who thinks that grapes don't ripen in Champagne should drink this wine. The fruit is completely infused with chalk, and there is a racy streak of acidity that cuts through and cleanses the palate. The finish is fragrant and long, and tickles the cheeks. And it's clear that I opened it too young, as there is ample structure and acidity and although the wine is completely delicious, it seems like it hasn't fully discovered its inner harmony. If it sounds like I'm waxing rhapsodic about this wine, I am. It's a true beauty, one of the best NV Pinot Noir based Champs that I've had. And it's interesting to compare this to, say the NV Billiot Brut from the neighboring village of Ambonnay, also a grand cru village. I love Billiot's wines, but whereas they seem more exuberant and muscular to me, Lahaye's wine seems more controlled, with more finesse, yet equally intense. I'll have to test that theory one day by drinking them together. It's fashionable among many knowledgeable wine folk to hate on points as a means of rating wine. And why not hate? Points implies that there is an absolute value somewhere in wine, and that there are critics who can discern this value to the detailed level of differentiating between an 89 and a 90, or a 92 and a 93. Points tries to force a round peg into a square hole. Points takes us to a place where one person's palate is correct and that $$$ worth of purchasing decisions should be based on that opinion. Points creates an unhealthy system of incentives for producers, importers, retailers, consumers...everyone. You probably don't need me to tell you why points are bad. I understand all of those ideas. But I've been thinking about points lately. Are they automatically terrible, or in the right hands, can they be of some use? Allen Meadows, the Burghound, uses points in a way that works for me, mostly. He uses a range for wines tasted in barrel - a wine might be scored 88-91, for example. According to his scoring explanation, that means that the wine will be somewhere between high quality to outstanding. Wines tasted when market-ready are assigned single scores. Retail price plays no role in the scores, so Meadows is not taking value or lack thereof into account. A 90 point Beaune wine that costs $37 is the same qualitatively as a 90 point Beaune that retails for $85. 90 points in Beaune is 90 points. And Meadows is stingy in general with the points, which I think lends credibility to the whole system. He says "There will be relatively few 90+ point wines, simply because there are relatively few outstanding and superlative wines." In general I find the Burghound's system to be helpful because he is consistent with his own preferences, and I can figure that into my own calculations about whether or not to buy a wine. For example, the highest score ever given to a wine from Nuits St Georges is 94. Pommard, with the exception of one wine from 1864 and another from 1962, highest score is also a 94. Volnay, with the exception of a few wines from the 1800's, 96 is the highest score. Pernand Vergelesses - 92. Gevrey Chambertin - 99. The sample size he's working with is high enough so that I can trust these numbers to mean that Meadows prefers Gevrey Chambertin to Volnay, which he prefers to Nuits St Georges, which he prefers to Pernand Vergelesses, and so on. And within those appellations I can see which vineyard sites he prefers, which producers, and which vintages. I don't have to agree, but I can understand his view, and that helps me place his individual scores and notes into context as I try to reconcile them with my own preferences. But I have some issues with his system too (and any points system). One question is this: is a 93 point Chambolle-Musigny better than a 93 point Savigny-les Beaune? Burghound's highest ever score for a Savigny-les Beaune is a 93. I won't reveal the wine(s) because that would take information that he charges for and make it free. The highest ever score for a Chambolle wine is a 99. So this clearly shows that Meadow's thinks that the wines of Chambolle can achieve significantly greater heights than can the wines of Savigny. Meadows also says: "Wines are evaluated within the context of their appellations. Simply put, that means I expect a grand cru Burgundy to reflect its exalted status." So a 93 point Savigny means that it is the finest wine of its kind, the absolute best Savigny thus far possible. Is a 93 point Chambolle better than this Savigny or of equal quality? If the Chambolle is scored within the context of its appellation, and if Chambolle is a better place for wine to Burghound, maybe the standards for Chambolle are higher than they are for Savigny. I really don't know. And what if this 93 point Savigny can be purchased for about $50 and the 93 Chambolle costs $130. Seems like a no brainer. Unless Chambolle is better in an absolute sense, because then the 93 translates to, let's say, 95 in Savigny terms. Even then, how much money is each extra point worth? Is a 93 point piece of pottery better than a 93 point watercolor painting? A 89 point rye bread better than a 89 point piece of injera? A 91 point massage better than a 91 point pedicure? A 97 point Yo La Tengo song better than a 97 point Aimee Mann tune? I'll take pottery, injera, a massage, and Yo La Tengo, but that's just me. My wife says I should get a pedicure, by the way. Maybe points can be useful if the person doling them out focuses on only one art/craft form, and clearly states their own personal preferences. For example, a critic might say "I am a BBQ fanatic and I will extensively rate BBQ. By the way, I prefer pork to beef and I like no sauce whatsoever, salt rub, no spices." If this person is also giving out points to side dishes and brunch spots and hangover remedies, I just can't follow everything. Unfortunately today it is rare for a wine critic to focus on only one thing, the way Burghound (almost) does. Who, for example, could make a living out of being a Beaujolais critic?